The ancient Hawaiians did in fact practice human sacrifice and the heaeu was the place that this took place. In the flickr set, there are several pictures of Hawaiian liei and gords for drumming. This was the location that the sacrifices took place. Jim and I walked around the structure and found a nice big lawn to practice T’ai Chi. We took a few minutes to run through our form. It was a special moment to be able to stand with the wind, ocean in near this amazing structure and practice. This afternoon we went snorkeling at Mahukona Beach Park. This was a location that sugar cane was processed and shipped out. There are old buildings from the railroad when it used to go through that part. The location is a harbor and there is a ladder that drops off into the water. From there, you can snorkel out pretty far. This was the first time I had ever snorkeled. We saw yellow tangs, parrot fish and the official fish of Hawaii, the Humuhumunukunukuapauaa. It was funny to have the feelings I felt. For some there it is a daily venture to snorkel. For me, having never done it, it was all wonderment. It was beautiful, scary, enchanting. There was so much color and life flashing before me. We went out into about 40 feet of water. It was impressive to see Jim swim to the bottom and back up. Not something I think I could have done. On Saturdays the town of Hawi has a farmers market and Jim and his wife set up a booth and serve Puerto Rican food. I helped Jim put the food, tables and cooking gear into a trailer and then we set off for pizza. The place we went to was packed and when we ordered, they told us it was going to be 45 minutes. Jim said that he had the perfect excursion for 45 minutes and we jumped in his van and went east. As we drove he told me about the way that the Hawaiian people divvied up the land. There was land division from ravine to ravine that started at a watershed. We made our way through 4 breathtaking and very lush areas before we got to where the road dead ends. The area here was spectacular. The Polulu Valley is just beyond here and as you look out near where the road ends, you can see the cliffs on the shore. This is an amazingly beautiful site. I am going to plan a day to hike down onto the black sand beaches and take pictures of this amazing place. Pizza was pretty darn good! After the pizza we went to a kava bar. I’ve never had kava. It was described as a taste between Novocain an dirt. The affects are interesting, mild, very relaxing. The people in town are very warm to begin with but this place had a really nice vibe. We sat down to found a jenga set. As Jim started to put it together, there were 3 girls, probably 7 to 9, that came over. We ended up playing them (i won!). Oh! The gal I sat next to on the plane. She was at the Kava bar. We struck up a conversation and as it turns out, her father is one of my old bosses from Broderbund, Nick Robins. It’s a small world after all! One last thing we did… we went and set up the tent for their place at the farmer’s market. It was a busy day. Very fulfilling. Lots of stuff got packed into the day. Tomorrow, the farmer’s market where there will be music, food, and fresh produce. Sunday I think I will try to do the hike down to Polulu beach and take pictures of the lush ravines along the way. This entry was posted in Event, Hawaii, Living life by markdeso. Bookmark the permalink. I’m envious, I love the Big Island and it looks like you are having a great time. Just want to correct a few things. It’s written as ‘Kamehameha’ and heiau as place of worship. 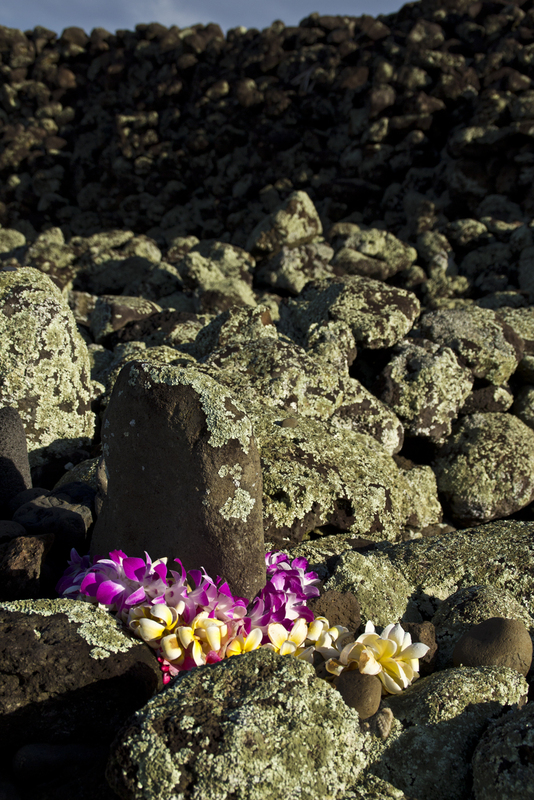 There are many different types of heiau, not all are luakini for blood worship. Kamehameha birth place is Mo’okini, a luakini heiau. It is true, that Hawaiians practiced human sacrifice at luakini heiau, however, the intention of it is not cavalier. In truth, it is no different than the state of Texas practicing human executions for specific crimes. Think of human sacrifice in this context, that someone had committed a heinous crime, to be incarcerated in a slave state, losing his geneology, his family. The execution is ritualistic, swift and unbloodied. The execution by way of sacrifice to a Deity, would not only restore his geneology and forgive the offensive crime, but purify his mana and body so that his offering is elevated. So instead of saying “may god have mercy on your soul”, it is liken to “you are forgiven, you are pure, you are the highest offering to God”. Also, only men were sacrifice. Never women or children. Another interesting luakini heiau is Pu’ukohola in Kawaihae, on you way down to Kailua-Kona. Ahu’ena in Kailua-Kona, however, is not a luakini heiau, but was the residence and altar of Kamehameha I and briefly, the capital of the kingdom of Hawai’i. Haunani, thank you very much for the moat thoughtful and thorough correction! I appreciate you taking the time. Thanks for sharing the wonderment of your experience so genuinely. Wishing you more for the rest of your time there. Thanks, Karuna! I will be sure to!!! !